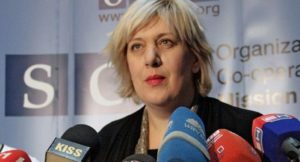 VIENNA, 26 May 2016 – The Italian Senate should consider pending legislation that would increase the maximum penalty to 9 years in jail for criminally defaming elected officials and judges in light of its effect on free expression, OSCE Representative on Freedom of the Media Dunja Mijatović said today. The current maximum penalty is 6 years. Defamation laws should not be tools for politicians and those in authority to silence critical voices, she added, noting that public figures should withstand a higher degree of scrutiny and criticism because of their public roles. Mijatović has long campaigned for the complete decriminalization in the OSCE region.